OR maybe you’ve made a habit out of eating whatever looks good, avoiding the gym, and staying up as late as possible. So, one habit I have today is the habit of emptying my car of EVERY item that doesn’t belong every single time I get out of my car (every wrapper, piece of paper, etc.). But it wasn’t always this way…my car used to perpetually have a mess of stuff that I’d “deal with later.” And it would get UGLY. Then one day it occurred to me that if I always left my car with the same stuff I brought in, a mess of stuff could NEVER accumulate. At first this idea felt TOO good to be true. 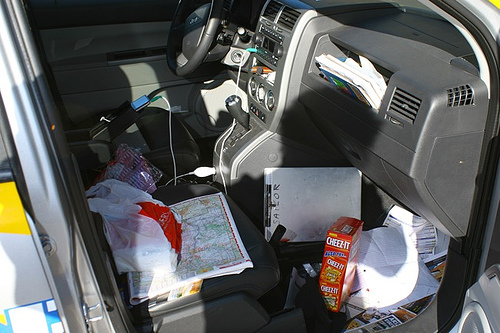 You see, it really felt to me like a law of the universe that my car would accumulate stuff in it everywhere…in the visible areas and the hidden areas. But as I thought it over, I saw that the ONLY relevant law of the universe was that the stuff that piled up in my car was a result of my actions. The logic of the idea was airtight; NOTHING could ever appear spontaneously appear in my car that I didn’t bring in with me. Therefore, if I exited with everything I brought in, nothing would EVER accumulate. At that moment, I decided to always get out of my car with everything that I’d brought in. What I had effectively done was to decide to make a HABIT. And you know what? Almost like a miracle, it WORKED. I have had a completely clean car for YEARS since that day. I have NEVER again had to clean out a bunch of junk from my car that didn’t belong. That simple habit has kept the interiors of my cars nice, clean environments–environments that that I enjoy getting into every day. Now, I want you to think about what new habits might have a major effect on YOUR physical health, fitness, and appearance. What is ONE key exercise or diet habit that would make a huge difference if you made that habit a part of who you are? Even if such new habit seem impossible or “not you” right now, just focus on where the logic is SOUND…where if you did that action habitually, you WOULD see the outcome you really want. Now I promised you better abs in the title of this newsletter. What fundamentally controls how good your abs look is how well you treat your WHOLE body. There’s NO single exercise that can make your abs alone look better if you’re in bad shape. You can forget anything you might have heard on late-night TV. It doesn’t work. BUT if you do what is necessary to get your whole body in great shape, your abs will SUDDENLY look amazing right along with everything else. It DOES work, and It happens without doing anything extra. If you aren’t happy with ANY particular part of your body or level of fitness, then your greatest leverage is to work on your general HABITS in diet and exercise. You CAN form new habits; and you have in the past. If you think about your life today, you probably have several habits that you didn’t have 10 or 15 or 20 years ago. What is one habit you would like to have 10 or 15 years from now? Maybe it’s the habit of never storing any junk food in fridge or freezer or pantry. Maybe it’s the habit of avoiding all sugars and refined carbs at every meal out. Maybe it’s the habit of exercising to real exhaustion once or twice per week. Maybe it’s the habit of bringing your own healthy lunch to work. Maybe it’s the sleep habit of being in bed with the lights out at the same time every night. Those are just ideas…decide what YOU need. And feel free to write to me and tell me what you came up with. Maybe you have something good I could share with my clients and readers. AN IMPORTANT NOTE: I think it’s not normal for a new habit to get established instantly. It DID work that way with my car emptying habit, but that’s the exception. That example shows how simple and effective habits are, but we’re usually going to have to make at least 10 or 20 attempts before a new habit really sticks. ACCEPT this fact, and be ready for what it takes. Because of the above point, I recommend WRITING your habit down. Figure out how you’ll be reminded of the habit you want…reminded consistently until it’s really “stuck” and has become a part of you. You might need some tricks or motivation to stick with the habit. You’ll figure out what you need to do once you set your mind to it. It might take a while to establish, and it might be fast. Either way, the sooner you begin, the sooner you’ll arrive. Good luck, and I’ll talk to you again soon. Oh, and if you need help locking in your habit of working out regularly, click on the “Introductory Workout” link above, to learn more about how we might be able to help. I got an email response to this that I thought I’d post here. Last updated by Chad Morris on August 30, 2011 .